By now many of you will have seen the new Village Sign at Stoke Ferry. This was started last summer when the Parish Council asked the local art group for some ideas for a new sign. We then commissioned our local hardware company, family run Thomas Bonnetts, to make a bespoke iron sign. We wanted this sign to be a statement piece of artwork which reflects iconic images, past and present, from around the village so we have a Ferryman, the old Railway Station, The Hall and the former Church. This structure comprises of over 100 pieces of metal and well over 200 nuts and bolts. It took over 70 hours to make and over 20 hours to paint. I am sure we can all agree this beautiful piece of art will be a talking point for many years and we thank the team at Bonnetts for all the hard work they have put into this. I would also like to thank another local family, Stephen Scotney, who has worked on the newly refurbished bench now placed in the garden area. Once again, local families are helping our community to improve. Thank you from SFPC to all those who have worked on these projects. The normal 4 yearly round of parish council elections is being held on 2 May. The local elections begin with the publication of the Notice of Election. Nomination papers can be inspected at the Returning Officer’s office at the BCKLWN, Kings Court, Kings Lynn, Norfolk, PE30 1EX by any person during normal office hours after the close of nominations at 4pm on Wednesday 3 April until the day before polling day, Wednesday, 1 May. There are qualifications to be eligible to be a Councillor, but any person wishing to nominate themselves and be a Councillor must abide by the Parish Council’s Code of Conduct and various policies, particularly in how it deals with the public, each other and its employee the Parish Clerk. These documents can be found on the Policies section of this website. (4) during the whole of the twelve months before the day on which they are nominated have resided in the parish or within 4.8 kilometres (3 miles) of it. Certain people are disqualified from standing. If any prospective candidate doubts their eligibility, please see Part 1 of the Electoral Commissions Guidance for Candidates and Agents. 2Agriculture Mill Housing Development Plans – The 2Agrictulture Mill is holding a Public Consultation on eds 12 December from 4.00 – 7.30 pm in the Stoke Ferry Village Hall. 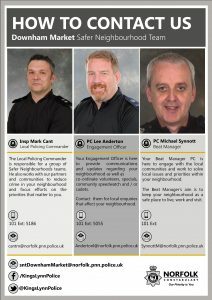 Please see following leaflet for more information, the had leafleted some parts of the village directly. 2Agriculture Mill Liaison Committee Vacancy – The Parish Council wishes to advise the Community that there is one place on the Committee for a Village Representative, the Committee is hosted by the Mill, two representatives of the Parish Council attend. It meets four times a year on a Wednesday at 4pm. 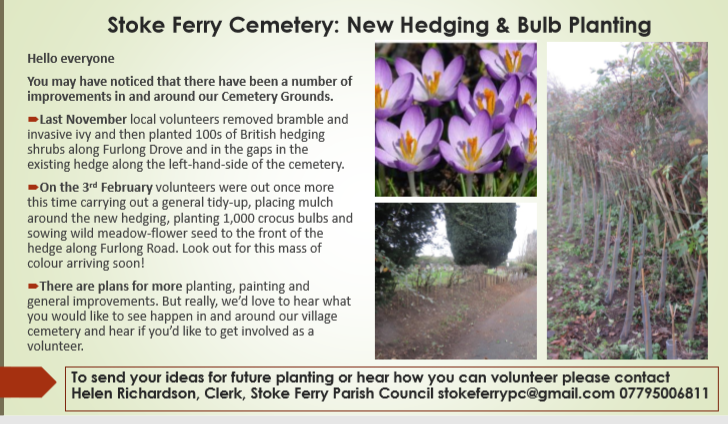 If you are interested in joining the Committee as a Village representative, please contact the Stoke Ferry Parish Clerk by email stokeferrypc@gmail.com or phone 07795006811. Neighbourhood Plan – Please see a flyer to residents who may be interested in knowning more or getting involved with creating the Neighbourhood Plan.